Acaia wood has comparative quiality as teak or other exotic wood, but it is much cheaper. What is more, exotic trees often comes from doubtful sources (deforestration of rain forests). Acaia wood belongs to top quality of resistance, it has the longest life up to 40 and more years in exterior. Coniferous trees are cheaper like acacia but they belong to the third or fourth quality class of resistance and with the contact with water their maximum life is 5 to 15 years. 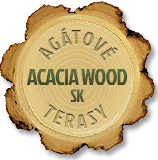 Acaia wood is the hardest of our central european woods, it is heavy, tough and flexible. It grows in our geography and despite exotic trees it tolerates cold and freeze. The wood has nice structure (pattern of growth rings), it has light yellow colour so it is possible to let it in a light tone despite the exotic tree which is mostly browned colour. Of course you can modify acacia wood by various oils and stains to darker tint. Acacia wood is resistant to wood destroying insects and molds. It is also resistant to water and humid enviroment.